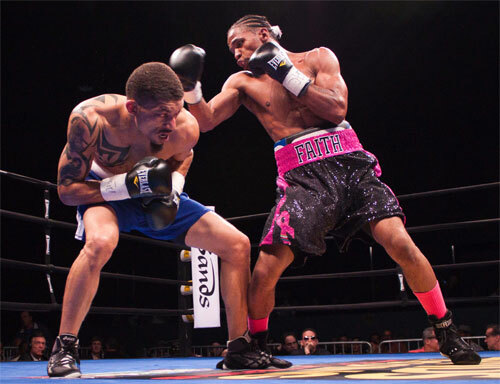 Bethlehem welterweight Ronald Cruz pulled one out of the fire before his hometown crowd at the Sands Casino Resort in Bethlehem, PA on Thursday night. Trailing one step behind a surprisingly effective Alberto Morales all night long, Cruz rallied down the stretch and scored a final-round TKO to extended his record to 19-2, with 14 KOs. It was a dramatic end to a frustrating night for Cruz. In the ring, there are two versions of Ronald Cruz, as those who follow him can attest. There is the hard-driving, body-punching, pressure fighting Ronald Cruz, the version who once mounted an 8-bout knockout streak and looked certain to make some noise among 147-pounders. Then there is a more passive version of Ronald that backs up a lot and seems only able to manage attacks consisting of a single punch at a time. This second version was responsible for his two recent losses and often made winning efforts harder than they should have ever been. On Thursday night against Morales, fans got to see both versions of Cruz in the flesh. For the first six rounds of their main event bout at the Sands, Miami's Alberto Morales, out-worked Cruz with an energetic performance that seemed to send Cruz into a shell. Morales was busier, more accurate, and began piling up rounds early in the fight while Cruz hesitated and backed into the ropes, time after time. When he punched, Cruz looked strong with his crisp shots, but he never threw more than one at a time. Meanwhile, Morales chugged along, kept throwing, and appeared to be carving out an unlikely win. In round four, Cruz won his first round when Morales suddenly looked a bit tired. However, the Floridian caught his second wind and stormed back to take rounds five and six, while Cruz attempted to get his hands moving. Cruz lost the sixth, but finished the round strongly. In the seventh, Cruz started slowly, but built a nice head of steam in the round. For the first time, it looked like he might be turning the fight around. The eighth was a bruising round, full of two-way exchanges. Both fighters battled hard, but suddenly Cruz was the stronger and fresher fighter. By the end of the round, Morales had a bloody nose and looked exhausted. However, Morales came out for the ninth back on track, and once again brought out the passive Ronald Cruz. Throughout the round, Cruz again backed up against the ropes and pruned down his offense to single shots alone. The round ended and it appeared that Ronald had squandered his rally and was back to blowing the fight. But then that other Ronald Cruz showed up. In round ten, a determined and hard-pressing Cruz stormed out and took the fight back from a tired Morales. After taking a few hard rights from Morales, it was all forward motion for Cruz. Suddenly things came easily for him. A hard right hand dropped Morales, but the tough front-runner got up and returned to the battle, determined to make it to the final bell. However, Cruz had the gas peddle pressed to the floor. A thudding body shot and crushing right hand to the chin floored Morales again. And this time he wasn't getting up. 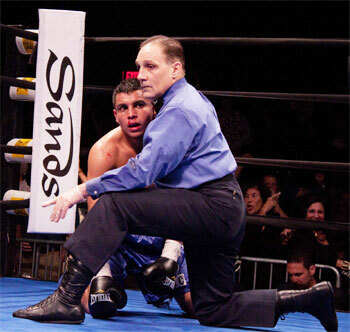 Referee Gary Rosado started to count, but then suddenly waved the fight to an end at 1:29. It was a thrilling end to a difficult night for Cruz. Although most ringsiders had Morales comfortably ahead after nine rounds, two of the three official judges favored Cruz by a point. A few of the rounds were close, but at the time of the stoppage, my score was 87-85 (5-3-1 in rounds) for Morales. But in the end, the scores didn't matter. The better version of Ronald Cruz came out and saved the fight with some last minute heroics. Morales performed well, but lost his third fight in a row to put him at 11-3-1 (8 KOs). Cruz improved to 19-2, 14 KOs. Camden junior lightweight Jason Sosa looked better and stronger than ever in his scheduled 8-rounder against Philadelphia's Tyrone Luckey. In round one, Sosa blasted Luckey with a left hook along the ropes that set the stage for things to come. In the second round, Sosa kept up the pressure and pounded away at the unlucky Luckey. As the round wound down, Sosa dug a vicious left to the body that sent Tyrone to the canvas for the count. Referee Shawn Clark stopped the fight at 2:58 of round two. Sosa improved to 10-1-3 with 6 KOs; Luckey slid to 5-4-1, 5 KOs. Allentown southpaw Jerome Rodriguez came out right-handed in round one against Juan Serrano, of Killeen, TX. Rodriguez, a stablemate of Ronald Cruz, dropped that first round, but returned in the second as a lefty, and went on to sweep the final five rounds to take a wide-margin unanimous decision. Rodriguez put on a display of power and sharp punching. His assault was so brutal in round four that he earned a 10-8 score on my card, despite never knocking Serrano down. The Texan stayed on his feet until the finish of the bout, but all three judges favored Rodriguez. Bernard Bruni had the fight a shutout (60-54). Robin Taylor scored 59-54, and John Poturaj had it 58-54. My card read 59-54. 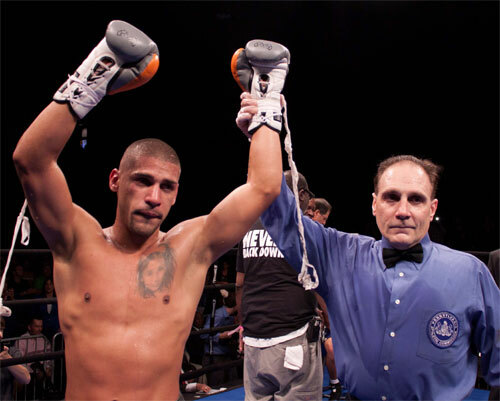 The win raised Rodriguez' record to 6-0-1, 2 KOs. Serrano fell to 3-8-1, 2 KOs. 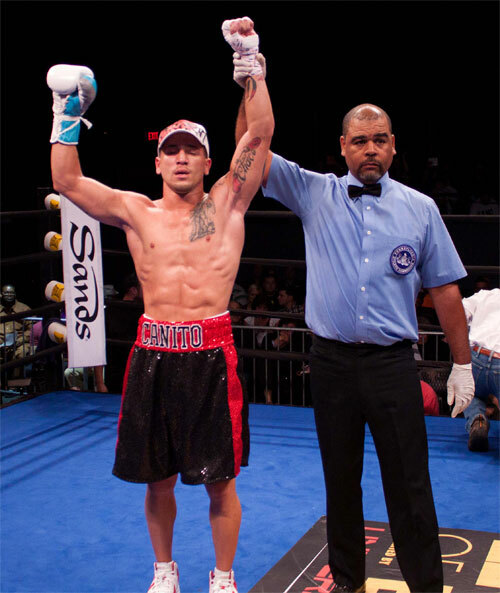 Junior featherweight Chris Diaz, Berlin, NJ, made a successful pro debut by dropping Johnny Portillo, Lancaster, PA, three times in round two to win his first bout by TKO. Hard right hands were responsible for all three knockdowns, the final one came as referee Shawn Clark was stepping in to stop the fight at 2:36. Portillo remained winless, 0-2. In a 4-round heavyweight fight, Allentown's Billy Marks seemed to do more than enough to take the decision over Dan Pasciolla, of Toms River, NJ. Marks was the busier fighter in the sloppy bout, however all three judges, Bernard Bruni, John Poturaj and Pierre Benoist, awarded the decision to Pasciolla with identical 39-37 scores. I thought Marks won all four rounds, although the second was close. In that round, Pasciolla, 1-1, wobbled Marks, 1-1, with his one good punch of the fight. In the best war of the night, welterweight Arturo Trujillo, Easton, PA, won a thrilling 4-round decision over Philly's Terrell James. The fight was a two-way battle the entire way. James drilled Trujillo with a left hook that appeared might end things right away. However, Trujillo fought back well, and even hurt James before the bell. This set the tone of the fight. Each time James would land, Trujillo would respond to the heat with his own attack. Back and forth, back and forth, back and forth. It was a great fight, but Trujillo had a few too many tools. The final round was perhaps the best of the fight. James scored a knockdown with a looping right, but once again, Trujillo fought back well. After four rounds, I had Trujillo ahead 39-37. Official judge Robin Taylor's score agreed with mine. However, Bernard Bruni and Pierre Benoist saw the fight a shutout for Trujillo, 40-36. Trujillo remained undefeated, 3-0, 1 KO; James lost for the first time, 1-1. In the walkout bout, heavyweight Joey Dawejko, Philadelphia, cruised through six rounds with Kevin Franklin of Charleston, WV. Dawejko won every round on my card. He was slick, but not so busy in the bout. He landed some stiff rights, once in the third and again in the sixth, and controlled the action throughout. Robin Taylor scored the fight 60-54, while Bruni and Poturaj tallied 58-56, all for Joey, now 8-2-2, 3 KOs. Franklin went to 4-7, 2 KOs. Boxing legends Larry Holmes, Gerry Cooney, Earnie Shavers and Thomas Hearns were all at ringside for the fight card promoted by Peltz Boxing, BAM Boxing, and Legends of Boxing. The Sands Event Center was full, if not completely sold out.